I'm waiting for my flight at Stansted airport. I am deciding to possibly give up alcohol and I am sat at my favourite cocktail bar. Usually I would get a glass of champagne before my flight, but today I decided to get a mocktail (non alcoholic cocktail). It has berries and mint which tastes quite refreshing. I can't wait to get to Toulouse and explore. I've just eaten Brunch in a french cafe which included a lot of food. A glass of orange juice, a cappuccino, carrot cake, pancakes, bruschetta, egg salad, and a salmon bagel. I am so stuffed and could not finish the pancakes :(. My impression of Toulouse so far is positive because I like the atmosphere. People are also friendlier than I expected...you know about the France stereotype right?. Speaking of people, my waiter is so gorgeous! I don't know what it is about French men that makes me weak. Anyway I think it is time to go and explore now because my time is limited. I am currently taking a relaxation break in a church. Prior to arriving, I took a trip to a violet themed boat shop. The purpleness reminded me of Marseille minus the hefty price tag. I bought myself a towel, and can't help thinking about how I should of bought it in Marseille because it was half the price. Oh well. I feel like Toulouse is generally expensive apart from transport. A day pass cost me 6 euros which is the cheapest I have seen in Western Europe so far. Anyway, so after the lavender shop I came to Basilique Saint-Sernin church. It is so peaceful and quiet in here which is nice. I am guessing that this church has some historical significance because there are sculptures and information plaques everywhere. But...they are only in French so I don't understand anything. I'm going to relax here for a while and then head off to a museum. I am now "reporting" from the airport. So I went to Musee des Augustins and it was really cool. They had some Roman things but yet again everything was in French. I guess that is not a bad thing because it means that tourism has not taken over Toulouse yet. A staff member told me off for using a selfie stick in the museum gardens. I could understand not using one inside but this was outside in a quiet area! So of course I did it again when the woman was gone. It was a beautiful garden and I needed at least 1 selfie to remember the trip. After that I wondered to the Pont Neuf bridge to explore and snap a photo. 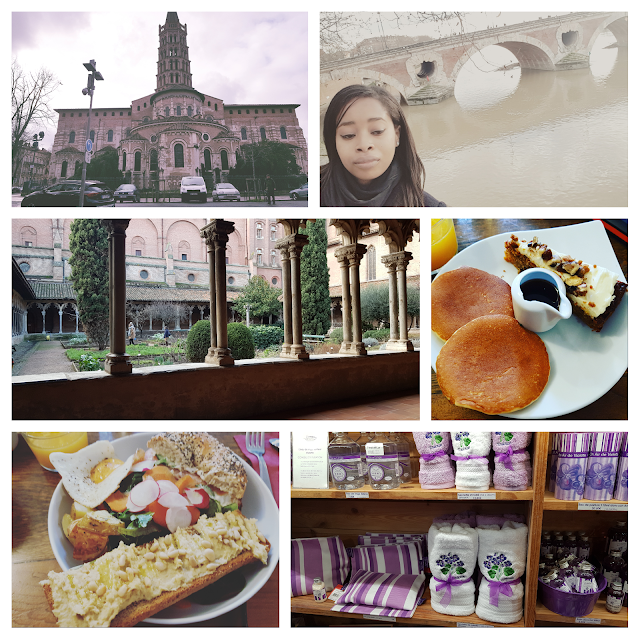 Anyway, I have enjoyed my day in Toulouse despite the rain and freezing cold. I personally don't think that any longer than a day is needed to explore this city. I am off to Paris next month so that will be a continuation of my France adventure. But for now I am going to enjoy my pasta and wait for the flight back to London.